I had to join in on the Flourishes Bring Back Beautiful challenge this month. The challenge is to use a fold, so I made my own card up this time. I really wanted an envelope look, so I created my own and used an old border die from Spellbinders to add some zing to the edge of the card. I inked the edges of the card with mustard distressing ink, on both the outside and inside of the card. 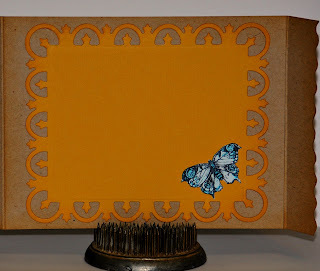 I colored the image with Copics and stamped the image three times, so that I could cut out two butterflies and pop one up on the front and stick one on the inside. 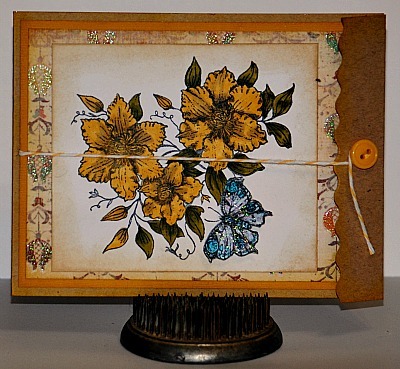 Lastly, I added a button and some twine from my stash to keep the card closed. I hope your week is going smoothly.....it's halfway done! So, I'm from Brandon area, where do you get your Copics from? Do I have to make a trip to the peg? or does someone in town carry them? This is for the anonymous comment above. I buy my copics in Winnipeg or on line. If you'd like to know more, please email me. I'd love to know who you are--perhaps we could have a coloring get together? Wonderful take on the envelope challenge!! Awesome colors too! Your card is so pretty!